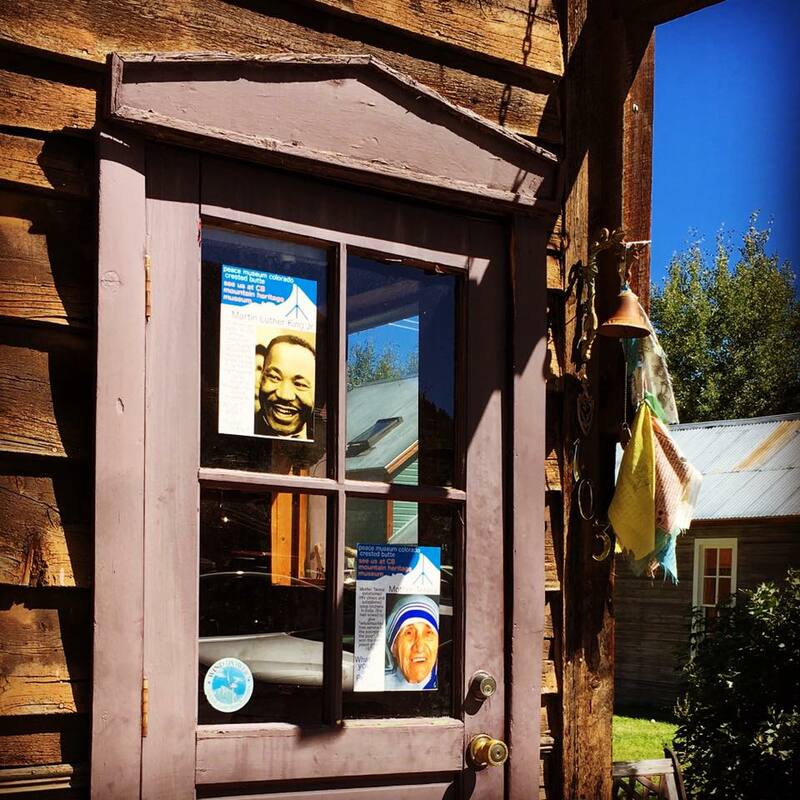 Windows for Peace, an innovative, interactive, outdoor exhibition is designed to educate visitors to the Historic District of Crested Butte about Peace Heroes, Peacemakers and Peace Allies. Peace Museum Colorado works with business and property owners to display informational graphics containing artwork and brief summaries of Peace Culture Heritage in highly visible public areas. The combination of visual graphics and often-historic, iconic local architecture is intended to be complementary, as they immerse the observer in the “everyday” environment of local Peace Heroes, Peacemakers and Peace Allies- near their homes and on the same streets they traveled. Do you know someone who should be a Peace Hero? Please click the submit button below to let us know! Peace Museum Colorado works with Colorado and nation-wide colleges and universities to provide a graduate internship program that focuses on peace studies research. This research internship is designed to build and maintain, in quality and quantity, the database and presentation of Peace Heroes, Peacemakers and Peace Allies in various Peace Museum Colorado exhibits, programs and projects. Mediation Workshops are designed to train community members on the basic skills needed to mediate and negotiate the most common forms of conflicts that occur in our daily lives. Focus is placed on neighborhood, school and workplace conflicts. Trainings are planned, written and delivered by trained Mediation and Counseling professionals volunteering with Peace Museum Colorado for the purpose of mediation trainings. Mediation Workshops are given on a quarterly or seasonal schedule and are offered primarily in Gunnison County, Colorado. Peace Museum Colorado, at the discretion of the Board of Directors, aims to make mediation workshops and conflict resolution trainings available at the lowest possible cost to participants. Peace Museum Colorado hosts special events and Speakers Series featuring guest speakers, films or panels organized for the purpose of public education, fostering dialogue and community enjoyment on topics related to peace, peace museums, peace culture, Colorado history and heritage, peace movements and other topics upon approval by the Board of Directors. Speaker Series event tickets are available to the public, however supporters who have made an annual donation at the level of “Member” or higher may obtain tickets at a discounted price. It is the objective of Peace Museum Colorado to have at least one guest speaker each year a recognized Peace Hero, Peacemaker or Peace Ally. educational component and an outreach component. In the former, the program educates locals and tourists to the Gunnison Valley and other outdoor sports or public land users on the importance of ecological sustainability and stewardship; respectful shared land use practices; and the importance of environmental peace in local, national and international peace-building. See Community Outreach Activities for additional activities descriptions for this program. Peace Museum Colorado curates both print and online publications, including a blog, a map of Peace Sites in Colorado, newsletters, journals and journal articles, manuals, and full-length publications. Submissions are accepted on a rolling basis except when otherwise noted. These publications are intended for educational use only. In general, Peace Museum Colorado’s youth oriented programs include special academic events and presentations in public and private K-12 classrooms in the Gunnison Valley and throughout Colorado that aim to teach mediation skills, alternative conflict resolution techniques, engaged listening, dialogue and negotiation skills, teamwork and consensus building, dignity, tolerance, equal rights, interpersonal communication, emotional intelligence, mediation, heritage, history, and social justice. Peaceful Solutions by Youth (PSY): Once-weekly small-group workshop for teenagers (13-18) to discuss current conflicts in their families, communities, or world and collaborate on peaceful solutions individuals or groups can effectively implement. Peaceful Solutions by Youth participants are encouraged to share their collaborative achievements through public outreach or education programs including training workshops, public service announcements, museum exhibits, art projects, or another collectively decided endeavor. Ombuds Office: In an extension of Mediation Workshops (see Educational Activities), the Ombuds Office will draw from the pool of trained community mediators and professional volunteers to provide the Crested Butte, Mount Crested Butte and greater Gunnison Valley with trained mediators to assist individuals with various conflicts. Through Peace Museum Colorado’s Ombuds Office, so-called “Ombudsmen” and “Ombudswomen” will provide community members with 1) individual coaching, problem solving and brainstorming sessions for nonviolent and peace-forward solutions to personal conflicts; 2) a safe space and optional neutral party for two conflicting parties to discuss, negotiate and resolve conflicts nonviolently. Peace Kitchens: Every Friday during June, July and August Peace Museum Colorado has a Potluck and discusses with various Peace Heroes in the Crested Butte area. We discuss, with young, old, male and female peace heroes and why they do what they do and why it helps each person in the Crested Butte Area. In addition to the summer, Every Friday in January and February will be dedicated to the Peace Kitchen efforts at locating and discussing with local peace heroes. Peace Walks: We want the community members to research, nominate and promote their own peace heroes, peacemakers, or peace allies. A Peace Walk is a form of nonviolent action, where groups of people walk a set distance to raise awareness on particular issues. The Peace Walk in Colorado focused on individuals who have contributed greatly to bettering the world, regardless of whether it was on a local or international scale. We call them “Peace Heroes”. Our aim was to promote and educate the public about the lives of exceptional people who are represented as “Peace Heroes” in the Peace Walk. The Peace Museum Colorado seeks to inspire a new generation of peace leaders through ‘Peace Education’. We hope that these new peace leaders construct a more peaceful world, where nonviolence is the way of life. Therefore, the Peace Walk is part of our Peace Education program and serves as an educational activity.